Ocean Bay Club is part of the famous Ocean Drive section of North Myrtle Beach. Beach music flows through the air, the sound of oceanfront activity is music to your ears and the rhythmic roll of crashing waves easily lulls guests to sleep. The family-friendly beaches right outside of Ocean Bay Club are perfect for playing and relaxing and socializing. Or if you’d rather just sit quietly and sink your bare toes into the sugary white sand, be our guest for indulgences like that, too. 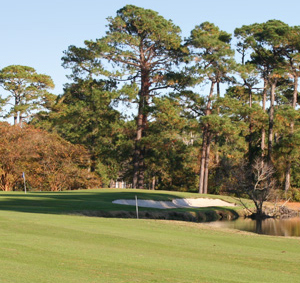 Book your golf package with Myrtle Beach Golf Authority. Dolly Parton's Dixie Stampede is a dinner theatre situated just minutes away from Bay Watch Resort & Conference Center. Pre-show entertainment in the Carriage Room is electrifying while the dinner served to guests as they sit around the expansive arena is delicious. Part of the fun of this four-course feast is eating it with just your hands. Horses, buffalo, ostriches, pigs and more have graced the stage of Dolly Parton's Dixie Stampede. The show is brimming with country music and gospel surrounding competitive games where your family either cheers for the North or the South.